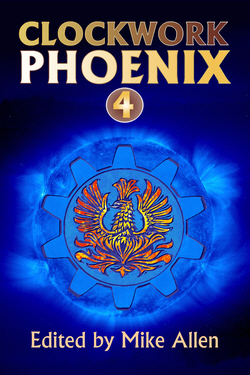 What kind of stories will you find in Clockwork Phoenix 4? Only those are that are magical, imaginative, heartwrenching, just plain bizarre, forward-looking, backward-looking, biological, romantic, hopeful, darkly funny and openly frightening. All the words that describe the best speculative fiction you’ve ever read apply. In fact, if this isn’t the epitome of speculative fiction, I don’t know what is. Mike recently did an interview with me over at BSBB, and I asked him about the job of an editor. Among other things, he described it as being similar to being the director of a play. Did you recently see a play or a movie that was more than the sum of its parts? How about a musical that was only 2 hours long, but seemed to have weeks of song in it? That’s what Clockwork Phoenix feels like, like time has been frozen, allowing Allen to cram far more beautiful strange things than the laws of physics should permit in less than 300 pages. Allen is a dude who really, really knows how to direct. I used to always read anthologies in the order the stories were presented. I started liking anthologies much better after I decided I’d read the stories in any damn order I wanted (usually starting with the shortest). I know Mike Allen put these stories in this particular order, for a particular reason, and by reading them out of order it’s like I’m going through his carefully curated museum backwards. To be even more contrary, the order I’ve reviewed a handful of stories in isn’t the order they were presented in either. I’ve not read much from most of the authors in this collection, so I greatly appreciated the “Pinions” section in the back, where each other offers a short bio, and more importantly a little snippet about how their story came to be. It was very nice to read that Corrine Duyvis is an arachnophobe. Here are my thoughts on a handful of selected entries. This is just the smallest taste of what awaits you within these pages. Where available, click on the author’s name to visit their website. The Old Woman With No Teeth by Patricia Russo – The Old Woman has hired someone to transcribe her story, but since he keeps getting things wrong she interrupts and tells him what he aught to be writing down. Their interaction is hilarious, but her story starts out sadly. The Old Woman is very lonely, and wants a family. She goes into the city to find orphans who might want to be adopted, and instead finds another population that is in more dire need of being wanted. It’s a little jarring how the story goes from a fantasy-feel to a matter-of-fact feel, but in the end it all works out. Beach Bum and the Drowned Girl by Richard Parks – what happens when two story cliches meet each other? Beach Bum is the mysterious guy the female protagonist always meets in the story, maybe to fall in love with, maybe to learn something from, maybe to be hurt by, maybe just to watch. Drowned Girl is the dead girl the investigator always finds, the mystery to be solved, the child to be saved. And who knows? Maybe Beach Bum and Drowned Girl can help each other out and learn from each other. It couldn’t hurt to chat with another cliché, could it?